Revered in India as the “Father of the Nation,” Mohandas K. Gandhi is a worldwide icon of non-violent political resistance. 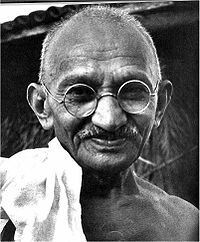 Gandhi was born in India, studied law in England, and then spent 20 years defending the rights of immigrants in South Africa. He returned to India in 1914, becoming the leader of the Indian National Congress. At that time, India was part of the British Empire, and Gandhi urged non-violence and civil disobedience as a means to independence. His public acts of defiance landed him in jail many times. In 1947 he participated in the negotiations with Britain that led to Indian independence. He was shot to death by a Hindu fanatic the next year. An advocate of simple living, Gandhi ate a vegetarian diet and made his own clothes from khadi cloth. The spinning wheel became a symbol of his uncluttered lifestyle. Gandhi is often called Mahatma, the Hindu term for “great soul”. Gandhi’s India takes you on an adventure to see where Mahatma was born and lived and where he led non-violent protests for civil rights. After breakfast you are driven and a city tour where you will see the Gateway of India and Chatrpati Shivaji Terminus. Afterwards you visit Khadi Gram Udyog Bhavan, an Indian government outlet which promotes Khadi cloth. It is under an umbrella organization started by Gandhi himself during the Freedom struggle. Fly to Porbandar where you will be met and driven to your hotel. Visit Kirti Mandir, the house and birthplace of Gandhi which now houses a museum. Tour Porbandar and see Drabargadh, Huzoor Palace, a massive structure like a European mansion, sprawling, with a large garden at the edge of the sea, Daria Rajmahal, Probandar’s sea facing city, and Nehru Planetarium. Drive to Kuchdi and visit a bird sanctuary which is quite popular with bird lovers and photographers. Drive to Bhavnagar and check in to your hotel. After breakfast drive to Gandhi Smriti, an institution built as a memorial to Gandhi. It contains a library, a museum and galleries of photographs depicting the life of Gandhi. Visit Takhteshwar Temple which is dedicated to Lord Shiva. Drive to Rajkot and check in to your hotel. Tour Gandhi Ashram, which was founded by Gandhi and served as an important center during the Freedom Struggle of India. It now has a memorial and a library. Visit Kaba Gandhi No Delo, Gandhi’s early childhood residence and Gandhi High School where he was eduacated. Drive to Ahmedabad and check in to your hotel. Visit Sabarmati Ashram on the banks of Sabarmati River, once the residence of Gandhi. This Ashram played a key role in history, as it was from here Gandhi urged the people of India to raise their voice against the rule of the British. Gandhi sowed the seeds of non- violence from this Ashram. Drive to Vadodara and check in to your hotel. Visit the Baroda Museum and Gallery and Kirti Temple. Visit Laxmi Vilas Palace, The Royal Family’s residence which is an extravagant building in Indo- Saracenic style. The palace built by Maharaja Sayajirao in 1890 is till date the residence of the royal family. See Mahatma Gandhi Nagar Gruh, the city’s town hall that was constructed in 1954. It is used for various cultural functions. Drive to Mandvi Gate. Drive to Champaner and visit Champaner-Pavagadh Archaeological Park, a World Heritage Site. Champaner is the site of Gandhi’s battle with the sharecroppers to fight over taxation by the landlords. See the Jama Masjid, one of the grandest Islamic monuments in Western India. Tour Nagina Masjid, which is also called the Jewel Mosque as it is built of pure white stone. Drive to Surat and check in to your hotel. Tour the Sultan of Gujarat Castle built in 1546. Drive to the Chintamani Jain Temple and Surat Fort. Drive to Dandi, a small village located on the coast of the Arabian Sea near the city of Navsari Dandi shot into worldwide prominence in 1930 when Gandhi selected it to be the place for the Salt Satyagraha. He marched from Ahmedabad to Dandi with some of his followers to protest against the imposition of a tax on salt. Fly to Amritsar via Delhi where you will be met and driven to your hotel. Today you will visit place of the Amritsar massacre, known as the Jallianwala Bagh Massacre after the Jallianwala Bagh Garden, where on April 13, 1919 fifty British soldiers were commanded and began shooting at Gandhi followers, an unarmed gathering of men, women and children, without warning. Fly to Delhi where you will be met and driven to your hotel. The afternoon is free to explore as you wish. A morning tour of Old Delhi includes the Red Fort, Qutab Minar and the Ghandi Museum. See the location where Gandhi was shot.